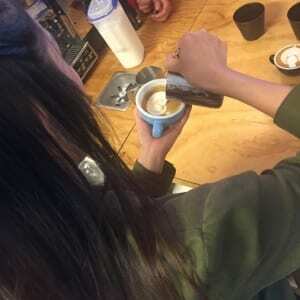 Milking the nut for all its worth, how a new wave coffee dream became a reality for Melbourne cafe owner. About 4 months ago a customer walked into Particle Cinnamon Cafe, Avondale Heights, and asked owner/operator/barista Zac for a 'standard' full cream latte. Doesn't seem such a strange request, in fact probably one of the most 'normal' requests one can make in a Melbourne cafe. 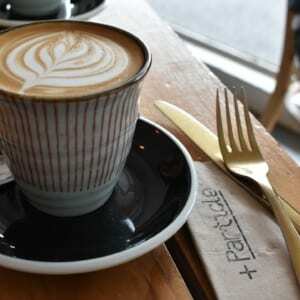 Thing is, Zac and Particle Cafe are challenging that 'standard' - what is a normal latte? Zac responded to the customer apologetically, but confidently, "No, Unfortunately I can't as we don't use dairy milk at all here." Particle Cinnamon opened 18 months ago, as a ‘normal’ café, offering ‘standard’ drinks and food, but over the first 6 months of being opened something happened. Zac and wife (who is the amazing cook at Particle), inspired by a documentary, changed the way they viewed food production, and decided to re-evaluate their personal consumption, the couple pretty quickly cut animal products from their diet and not long after were forced to question what they were doing with their café. The café, which was already facing its challenges, namely the location, decided to challenge itself some more. Situated in a relatively untapped neighbourhood of Melbourne the question was where are the customers going to come from? 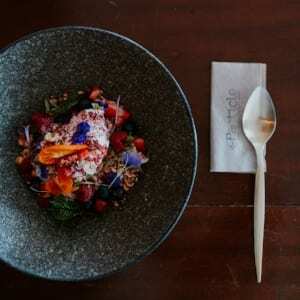 Few daring brunchers were travelling to Avondale Heights at the time, and, similarly to most outer-Melbourne suburbs, Zac was facing a local community who don’t really seek out new cafes, or seek out alternatives. No matter how you look at it, change is hard to facilitate. But they did it anyway, they faced any other café owner’s worst nightmare – they changed their café to an entirely vegan café, pretty much overnight. As you can imagine, business dropped. It was scary for the young couple, but they had a vision, and they stuck to it. Days, weeks, months went by and the customers were not coming. But then it happened, and much like the early 90s movie trope proclaims (from Field Of Dreams, Kevin Costner’s finest moment), “If you build it they will come”, they came. Trickling in through word of mouth (and the power of Instagram) they came, and Zac started to finally see the business grow – and grow in the way he wanted. He was able to serve up his alternative fare to customers that were seeking the alternative. It was a challenge, but all dreams are. Particle Cinnamon is now a foodie destination. 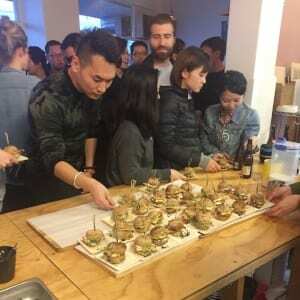 People are coming from everywhere to taste the plant-based delights. Success. So what of the lady that was looking for a ‘standard full cream latte’? Zac gave her options. Producing a variety of plant-based milks on the premises, he offered her one of those. Her response was she had tried long life Almond milk and really didn’t like it. Zac talked her into trying a fresh almond milk latte from almond milk he’d made that morning and after a sip she was in love. You see Zac, a career barista, did his research when setting up as a plant-based café – because coffee is important. His research found most commercial long life nut milk companies use only 2% nuts and include a heap of ingredients that are not required to make it shelf stable and that heap of ingredients also affected the flavour – and not in a favourable way. The problem with alternative milks in Zac’s view was that people are only shown the basic standard and rarely experience how great they can be. So Zac turned this one customer’s opinion around, but how will he tackle the masses? Zac wanted to share the news, with the initial idea to email the best cafes around Melbourne to educate them how to make fresh delicious nut milks.But because emails are often unread, or discarded as junk mail he was inspired to come up with a better concept, putting all of his skills to work. 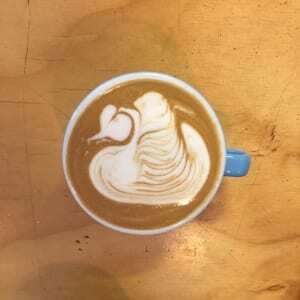 And that’s when was born the idea of a Barista Latte art competition using Cashew milk – which has the same flavour and texture to dairy milk – a way to present his new standard to the people behind the best lattes in Melbourne; the baristas. “After talking with Roy from Zest we booked in a date for the event and Zest created a poster that I could send out to baristas. I went on Instagram and searched through numerous hashtags including melbournelatte, melbournecoffee- to find the best-suited baristas for the event. 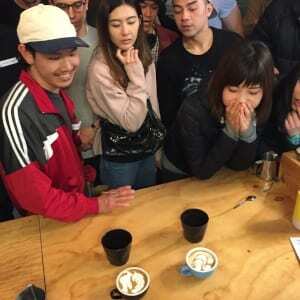 We successfully found 32 of some of Melbourne’s best latte art baristas from some of the best and most influential cafes. The night was fantastic, the first few people who arrived had a chance to experiment with this cashew milk that they had never tasted or worked with, they were very nervous. Next minute it was 6pm and everyone arrived. To kick the night off I introduced cashew milk to everyone, explained how to froth it, and its flavour. Then I made a fresh batch of milk in front of them to show how quick and easy it was to make. 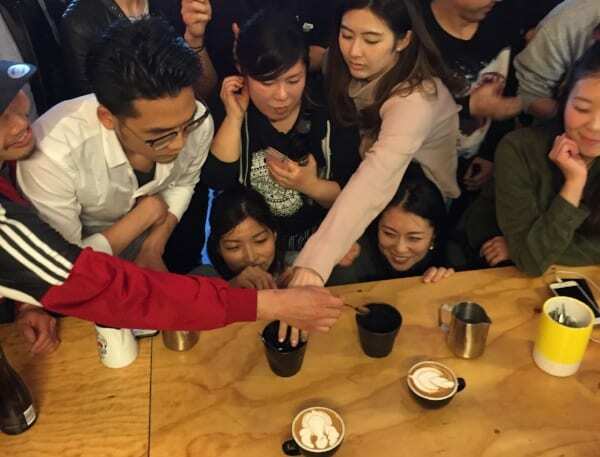 The competition started and 2 baristas were creating the best artworks they could at the same time and we had the rest of the crowed of 40 judging it, if one baristas latte art stood out then everyone would place a spoon in a empty bowl infant of the competitors coffee. During the event everyone also received a show bag including Zest coffee, a nut bag, Olinda Springs water, cashews, dates, (Particle’s own star ingredient) cinnamon – pretty much everything they needed to make there own nut milks. Since then I have received many emails of cafes that are now either in experimental stage or using the cashew milk in their own cafes. So there you have it, an inspired story, a happy customer, a passionate and determined business owner, and a crew of baristas with new skills. A Coffee Fairy Tale, indeed.